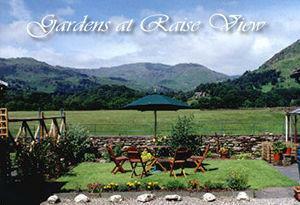 Raise View House015394 35215work Bed & BreakfastSituated at the northern end of Grasmere, yet just 5 minutes walk into the village centre, Raise View House has uninterrupted views of Easedale and the surrounding fells, including the famed Lion and the Lamb. Explore some of the most beautiful parts of the Lake District with easy access to many glorious walks, or by car just 20 minutes away from Keswick in the north or Windermere in the south. When you return in the evening you will be able to relax in a cosy atmosphere in the lounge, with roaring log fires in the late or early seasons. Car parking is provided for 6 cars, and the comfort cleanliness, and personal service together with a traditional Cumbrian breakfast, which is served in the elegant dining room. There is also a well-stocked honesty bar in the lounge.